According to Rector Todd A. Stottlemyer ’85, William & Mary President Taylor Reveley likes events to run like clockwork: no surprises. But the Board of Visitors had a big one for Reveley Saturday: an honorary degree conferred upon him for his service to the university, including a decade at its helm. 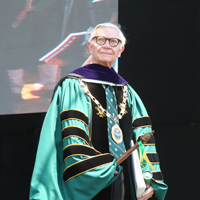 Stottlemyer interrupted Reveley at the end the university’s 2018 Commencement ceremony in Zable Stadium to announce the board’s unanimous decision and bestow the honor. Reveley, who will retire June 30, was visibly touched by the gesture and thanked W&M for the honor. “This is really a wonderful surprise and it’s extremely meaningful to me,” he said. Reading from the award citation, Stottlemyer quoted a former Rector in saying if Taylor had not existed, W&M’s destiny would have required that he be invented. Reveley, W&M’s 27th president, became dean of W&M Law School in 1998 after former U.S. Sen. Bill Spong instructed then-W&M President Tim Sullivan and the search committee to “Go get Taylor Reveley,” according to the citation. At the time, Reveley had been working as a managing partner with Hunton & Williams. A decade later, the Board of Visitors named Reveley interim president and then president of the university after the resignation of President Gene Nichol. He spent the next decade making the university more interdisciplinary and international, increasing the diversity of the campus community, strengthening connections to alumni and improving the financial resources of the university. The citation also praises Reveley’s scholarly work in constitutional law and acknowledges the role his family, including his wife Helen, played in his success. Reveley was one of five people to receive honorary degrees at today’s ceremony in Zable Stadium. Katherine Johnson, a NASA mathematician who helped make the first human spaceflight possible, also received an honorary doctorate as did W&M’s first African-American residential students, Lynn Briley ’71, Karen Ely ’71 and Janet Brown Strafer ’71, M.Ed. ’77. Johnson was unable to attend the ceremony due to health issues, but her daughters represented her at the event.